My wife, mother-in-law and I took a staycation yesterday afternoon compliments of DISARONNO and their new destination cocktail line. Their agency thought I might want to try making a cocktail or two devised with luxurious vacation spots in mind. I decided we'd go to Capri and see how we liked it. There are three other recipes I have my eye on as well. You should have seen the look when I got out the booze at around noon and took it outside with me. Of course I just wanted to take the perfect photo and have good light. Check out my photo above and critique it against their picture below. 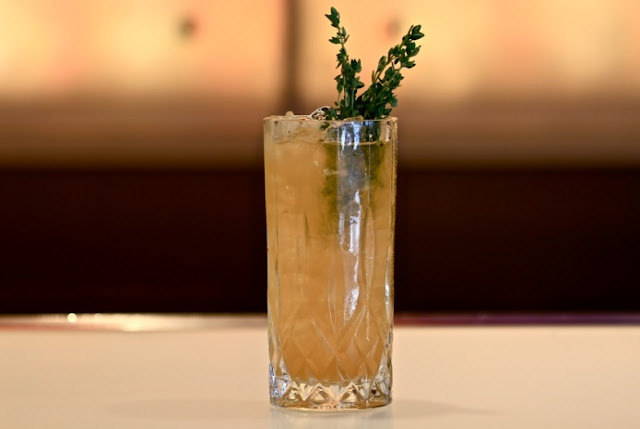 If I had it to do over again, and I probably do, I'd have used a different glass, I'd have made more so I could fill the glass, and I'd have used more thyme garnish. But oh well, still looks pretty nice. As for the drink itself, it was freakin' delicious. You could really taste the amaretto, but the fruity apricot really kicked the drink up a notch. It was a little too sweet, even with the lemon juice, and that was the comment my wife had as well, so I knocked that sweetness down with just a little extra lemon juice and it was absolutely perfect! Super refreshing! One last comment... I used Appleton Estate Reserve Rum in place of the Bacardi. Here are the recipe, instructions and reason this is a DISARONNO destination. Shake ingredients and strain over ice in a rocks glass; garnish with fresh thyme. This island off the south side of the Gulf of Naples hearkens back to the tradition of the Roman Republic. DISARONNO maintains its Italian roots with this destination, an attractive and popular space for European artists and intellectuals which saw the likes of Claude Debussy and Graham Greene.